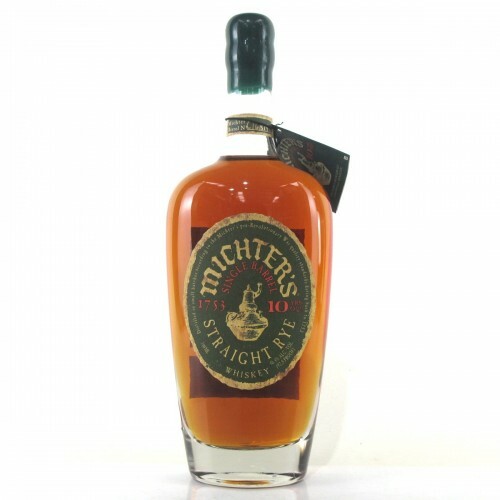 One of a limited production items, Michter’s 10 Year Single Barrel Kentucky Straight Rye continues the legacy of America’s first whiskey variety (rye) from America’s first whiskey company (Michter’s, originally known as Shenk’s). After a nearly three year absence from the market, Michter’s then Master Distiller Willie Pratt finally gave the green light for the re-release of Michter’s 10 Year Straight Rye in April 2014. Drawn from Barrel No. 14C16 at a natural strength 46.4% ABV, this limited release rye was bottled in 2014 and is increasingly difficult to track down. The benchmark is set so high that the distillery decided against releasing a 2015 ten year old rye as the Michter's Master Distiller decided it wasn't quite up to their usual high standards. Please note, limited to 1 per customer. Nose: Sweet from afar, then boozy and rich as you get near. Roasted fruit-like nuttiness with a pleasant sour smoke undertone. Palate: Flavour and pleasant heat are initially slightly overwhelming, but the second sip wakes up the palate and nuances emerge. Baking spices like vanilla and cocoa bean are evident. Finish: Big and mouth coating, it is incredibly easy to sip. Caramel transitions into butterscotch on the long finish.